Everyone needs a little help from time to time. With the aid of Self-Therapy, now you can finally help yourself! 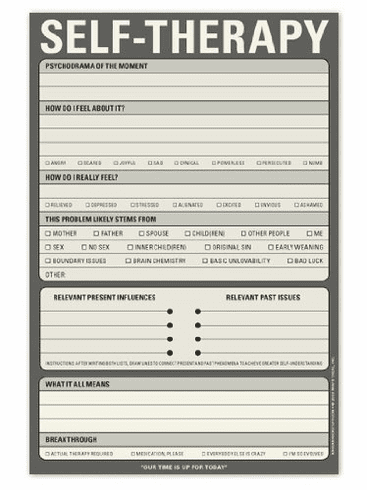 Whether you feel depressed, anxious, or simply well-adjusted, this step-by-step pad will guide you toward a breakthrough - or at least determine who or what to blame. Checkboxes are sure to satisfy your inner child! This pad will make you feel safe! 60 sheets.